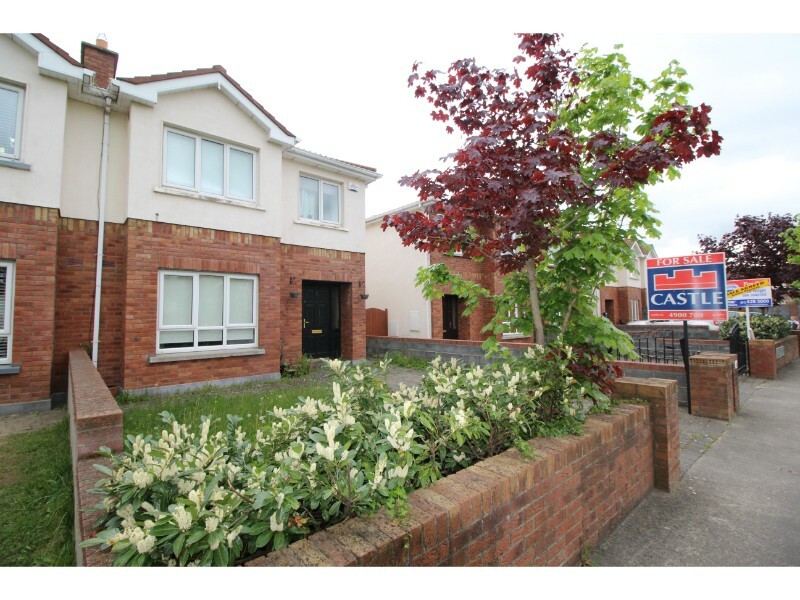 Castle Estate Agents are delighted to present No 15 Carrigmore Elms to the market for sale. 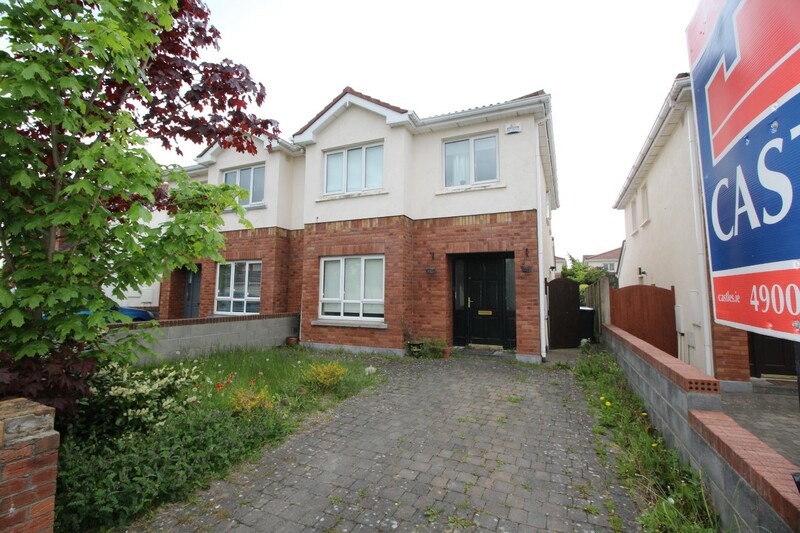 Sure to appeal to both first time buyers and investors alike this superb three bedroom, two bathroom home is presented in very good order throughout and is ideally located on on a quiet cul-de-sac just a short stroll from The Citywest Shopping Centre and LUAS line. All other local amenities (shops, schools, parks, N7, N81 and bus routes) are close to hand. This modern three bedroom home briefly comprises of a large living room to the front, fully fitted kitchen/diner to the rear, three well proportioned bedrooms upstairs with en-suite to master bedroom, family bathroom and downstairs cloakroom/WC. To the rear is a south-east facing lawned garden and to the front is a driveway providing off-street parking for up to two cars. Many additional benefits include full double glazing throughout and gas-fired central heating. Viewing is highly recommended and strictly by appointment only. 1) These particulars are set out as general outline only for guidance for intending purchasers or lessees, and do not constitute an offer or contract or any part thereof and none of the statements contained in the particulars as to the property is to be relied on as a statement or representation of fact. 2) All descriptions, dimensions, references to condition and any necessary permission for use and occupation and all other details are given in good faith and are believed to be correct, but any intending purchasers or tenants should not rely on them as statements or representations of fact, but must satisfy themselves by inspection or otherwise as to the correctness of each of them. Maps and plans are not to scale and measurements are approximate. No omission, accidental error or misdescription shall be grounds for a claim for compensation, nor for the rescission of the contract by either the vendor or the purchaser. They are issued on the understanding that all negotiations will be conducted through the firm. 3) In the event of any inconsistency between these particulars and the contract of sale, the latter shall prevail. 4) The vendor/lessor does not make or give, nor does any person in the employment of Castle Estate Agents Ltd. have any authority to make or give representation or warranty whatsoever in relation to this property. 5) Prices are quoted exclusive of VAT (unless otherwise state) and all negotiations are conducted on the basis that the purchaser/lessee shall be liable for any VAT arising on the transaction. 6) The terms, Vendor and Purchaser, where the context requires shall be deemed to refer to Lessor and Lessee and Landlord and Tenant respectively. We were very impressed with Peter from the moment we met him and I have to say he exceeded our expectations. As promised, he found us a buyer at a price that we needed to be able to afford to move (higher then several of our neighbours achieved recently). I cannot recommend Peter and Castle enough. Every member of staff I spoke with was incredibly easy to speak to, professional and efficient. Thanks all, it’s been a pleasure doing business with you. Peter promised to remove all the stress from this process for me and I have to say it was the simplest move I have ever made. He did a fantastic job and I want to thank him again for all his hard work and advice. Marian – this is the easiest recommendation I have ever given for professional services. Thank you so much for your patience, professionalism and work ethic. Hope you enjoy the wine. We will do business again I’m sure. This is the second property I have sold with Eugene and he has yet to let me down. Hopefully I won’t be moving again anytime soon Eugene, but if I do, you’ll be getting the call. Best of luck, keep up the good work. More than happy to give a testimonial Eugene, and will be singing your praises for a long time to come.Thanks so much for everything and for sticking with us! Chat soon. Mark, just a quick note to say thanks a million for all your help. I didn’t expect everything to go so well to be honest. If I know of anyone thinking about moving I’ll definitely pass your details on. Thanks again. Simone I just wanted to drop you a quick mail to say thank you for everything. I couldn’t have afforded to test the market with the house vacant and no rental income coming in, so the fact that you found tenants for a short term lease while also for sale, made the difference between me actually selling and not. Thanks so much again, hope to talk to you soon. Hi Mark. Just wanted to thank you for everything. You represented us brilliantly & was straight and honest from the beginning with no bulls**t. We will be recommending you to others! I just wanted to say a “Thank you” to David in Castle estates for all his help with the selling of my Father’s house. David was very professional and was always in contact with us whenever we needed him. Thank you again for the 100% service that you have provided to myself and Dad, David. It was great doing business with you and I would highly recommend your services to anyone buying or selling. Paul O’Connor was great to deal with. He helped with everything from start to finish on the sale of our home and even offered to help with the moving of our furniture to our new home. We couldn’t recommend Paul and Castle estate agents more, he was brilliant. It has been a pleasure to work with Castle, and especially Marion. Should I ever be in the market again, I will call on your services. It was a pleasure to deal with Simone from start to finish. She offered excellent advice on marketing the property and it really looked well on Castle’s website, she was also accurate with her valuation. Throughout she was available to discuss any matters which arose and I felt she really went the extra mile to market the property. I’d strongly recommend her to any prospective sellers as a professional and interested agent. Danny displayed high levels of enthusiasm from the start. He facilitated our prospective buyers with very flexible viewing times, his knowledge of the local area also helped . He was always available to chat and kept me informed throughout , ensuring the whole process ran smoothly. He managed the final stages of bidding professionally and we achieved a much higher sale price than expected. All in all , a great service. The sale took place over a number of months and during that time Danny was in regular contact to update me on progress and to offer advice. He was very personable, patient and easy to deal with and always returned my calls, which I really appreciated. I think Danny is a real asset to Castle Estates. He represents the company brilliantly and I would be happy to do business again with Castle Estates based on my interactions with Danny. Finbarr is a man of immeasurable integrity and treated me with much respect i.e. clarifying the process and feeding back all pertinent information, thus making the process for me, much more simplified and stress free. 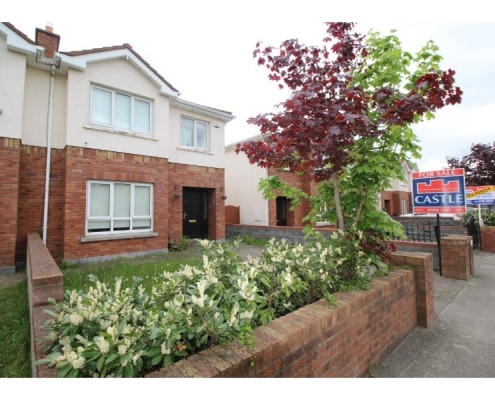 I would wholeheartedly recommend Finbarr Malone and Castle Estate Agents to anyone. It has been a pleasure to have gotten to know such an honest, efficient and polite gentleman. Would you like some free advice on what your property might be worth?